One of the items available at Swedish Christmas markets is Mandels, or cinnamon roasted almonds. I love to make and munch on these at Christmastime, and sometimes even share with friends and neighbors. The recipe I had used before instructed me cook them on the stove top. This was quick and easy with only a few ingredients, but since I was starting with raw almonds it made for a chewy (in a bad way) result. One of the commenters suggested baking the nuts first, so this year I decided to try a different recipe that involved beating an egg white (a little gloss for the finished product?) and roasting for an hour, stirring periodically. 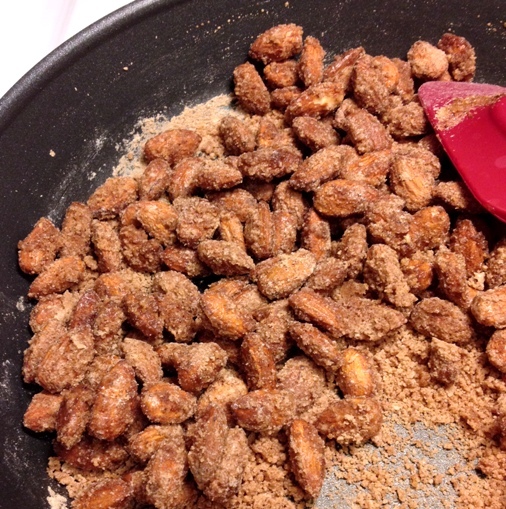 That made sweet and crunchy cinnamon almonds - perfect! Side note: My friend Kathy had the church gals over for a Christmas party this week, and she gave us bags of candied walnuts. Mmm! I may have eaten them for breakfast the next morning. Walnuts would probably work with the stovetop method since they have a good texture to begin with. 3. Bake for 1 hour in the preheated oven, stirring every 15 minutes. Allow to cool, then store nuts in airtight containers.